Can parents find joy in screen time with their kids? When the headlines keep telling us we are “slaves to technology” or “smartphones are putting our children in danger”, the author of The Art of Screen Time is unique in reminding us there is another way to look at how we use our devices. Anya Kamenetz is talking about the joy of screen time and how she is making personal choices to include technology in her home, while reaping the benefits. When it comes to being aware of the tech scares we read about everyday, Kamenetz has her finger on the pulse. She has been reporting and writing about education and technology innovation for the past decade, but her take is not a cynical one. And it’s no surprise that for someone who uses tech for her career and her delight, Kamenetz does not bow down to the heavy criticism. But what about for kids? Despite loving technology, once she started raising her oldest daughter, Kamenetz knew she didn’t have all the answers. Especially true when it comes to introducing tech to a younger user. The only consistent guideline she found amongst academics was, “don’t let your baby have screen time until age 2.” But the question remains, what next? That’s where her book, The Art of Screen Time, was born: a parent’s attempt to make sense of the tech and research chaos that is flying at us at warp speed. And isn’t that what we all are seeking as we stumble through the advice, statistics and personal experiences that stem from our family device use? 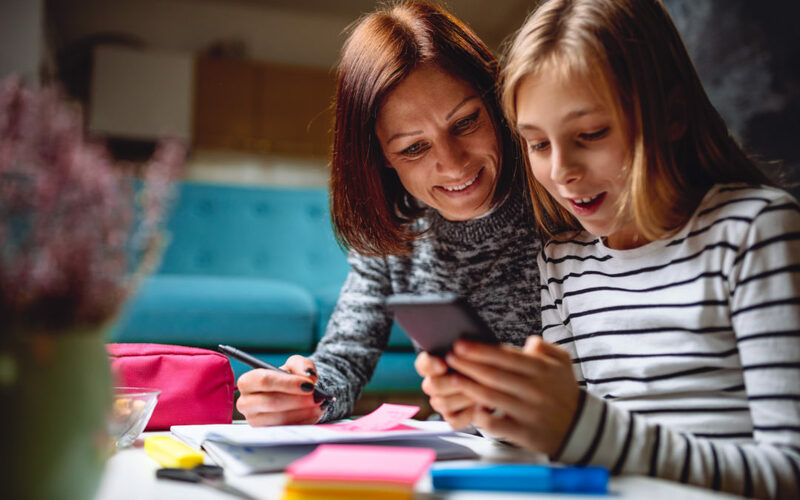 “It’s a really simple shift in perspective to say that if technology has a purpose in our lives as adults, that we want to share those purposes with our kids, because that way we’re going to model the most useful applications of tech,” said Kamenetz. But this mom of two doesn’t stop at just “useful”, she includes consuming entertainment, pop and high culture, basically anything you love that is worth creating, discovering and connecting with others on your screen. Anyone could argue that they should be on their devices at all times of the day, as long as they are enthusiastic, so where do we set the guidelines? Kamenetz doesn’t recommend this to everyone, but when you’re interviewing the expert, you have to ask what screen time rules she has set for herself. Kamenetz says she keeps her phone on silent, so she doesn’t check the information coming in with every ding and vibrate, but instead all at once. And at specific times, that she has chosen. Does she always model perfect tech behavior? Kamenetz is quick to admit, no. That’s probably the last advice you would hear from your pediatrician, but Kamenetz says it’s hard to avoid, so start the conversation and education around tech at a young age. She realistically described their own family tech use as “early imprinting”. It’s obvious, but a hard truth to swallow for some parents. Our kids want the tech just as much as we do. And they know we can’t live without it. That’s why Kamenetz suggests your education has to start a young age with kids, because they are going to be exposed to the devices, whether you like it or not. She describes in her book a technique modeled by her friend, where the parent explains why they are reaching for technology when their children are around. She says with one quick phrase or explanation, you make yourself accountable and transparent, so your kid becomes part of the conversation, rather than being ignored during it. In sitting down with Kamenetz or reading her book, the vibe is positive and hopeful, a breath of fresh air for parents who feel overwhelmed by everything that “lurks on the deep dark web”. She doesn’t pretend it will be easy to find joy, but she does say it is possible, even enjoyable.